We've already briefly featured our signature weapon in one of the previous updates, but this time we go a little bit more in-depth about the main gun in the game - the Mateba. Before designing the 'Mateba' we all agreed that the guns in our universe should all have a heavy and sturdy feel. Researching these kind of guns brought us to the Mateba 2006M and we decided to base the design of our main weapon on this existing revolver. It just fitted our world so well! Our version of the Mateba has 2 fire modes. The default fire mode shoots single bullets with pinpoint accuracy at a relatively fast speed. However it's not very suitable for close quarters encounters. That's where the alternative fire mode comes in. Right-clicking your mouse will result in a shotgun-like hail of bullets and any enemy in front of you will take massive amounts of damage, most of the time resulting in an instant kill. 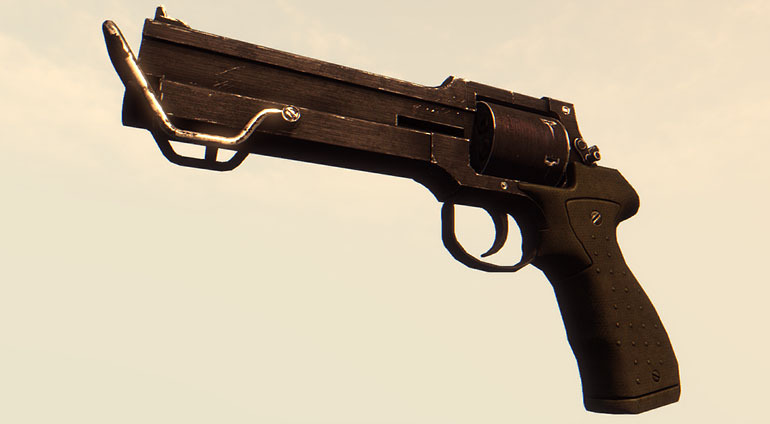 Looking at the gun, you would expect it to work like an average revolver; after a few shots the cylinder will be emptied of bullets and you would have to reload. However, our game takes place in the future, and we decided to give it a little twist by not having the player reload the gun at all. We found another existing design for a gun that describes how no bullets are fired, but instead a very quick burst will scrape small fragments of metal from the inside of a barrel. This is happening with such force that the fragments will melt before exiting the barrel, resulting in a burst of molten metal instead of your ordinary bullet. The power this whole thing provides goes way further than any bullet. However, such power doesn't come without consequence. 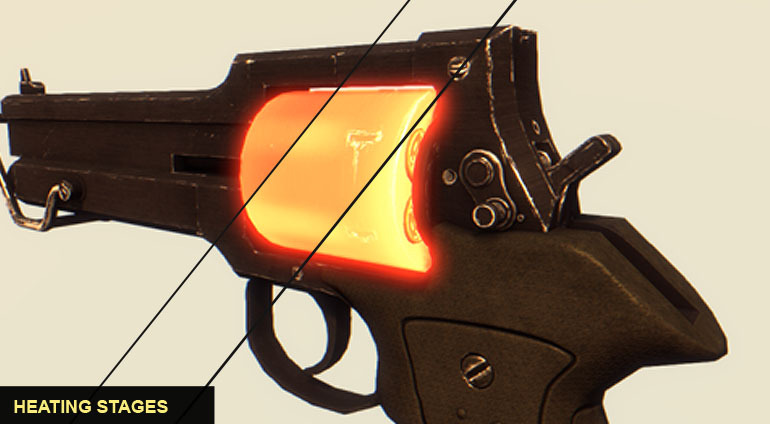 Our Heat mechanic causes the gun to rapidly heat up with every shot. The alternate fire mode generates even more heat per shot. If your weapon becomes too hot, you will not be able to use it until it has cooled down again, so the player would need to be careful with timing his shots!